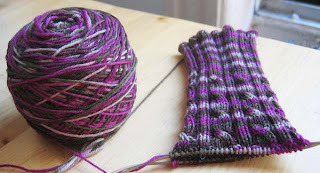 I’ve decided to start my sock over from the beginning. My knitting guru guide Janel had gotten me started, but without a pattern, and she sadly lives 3,000 miles away so I really needed something to follow if I wanted to get any further with this on my own. 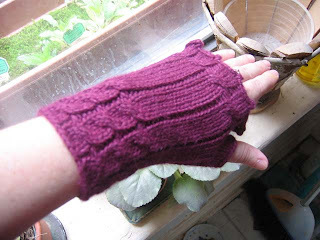 So I found this fun Nancy Bush pattern “Rib and Cable Socks” from the Fall 2005 Interweave Knits. It seems pretty simple but the cables add a little zing. 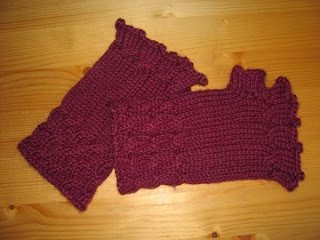 And can I just say that I love cables – they are easy and look like you’ve done something fancy! 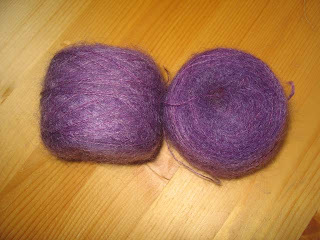 This is Alchemy Haiku (40% silk, 60% mohair) in amethyst. Purchased at Purl Soho – a very dangerous store for any yarn addicts. This store is very small but they have only the most exquisite yarn. I consider it an “artisanal yarn store”. As mentioned in my previous post I was going to get some more of the Rowan Kidsilk Haze but since the dye lots were so different, I decided to get something completely different and now this is going to be for my next lace project. All of the Alchemy yarns are heavenly. This one is so soft and the color is so rich. I can’t wait to use it! 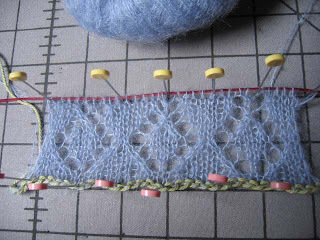 I’m using the new Addi lace needles which I really like. Having never knit lace before I can’t really give any authoritative review but I can say that the very pointy tips do seem to be very helpful. I loved knitting this pattern and I’m really happy with the end result. This was my first time knitting with double pointed needles which is a bit like wrestling with an octopus especially when you add in a cable needle but I more or less got the hang of it and it was a quick and easy knit. The Knit Picks yarn is nice and soft and, of course, very reasonably priced. I’m pretty sure I’ll be making a few more pairs of these as I’ve already had several requests for some Fetching gifts!